We all know what is 'Life'. Let us now see what is 'Homam' or 'Yajna' ? Lord Krishna explains "The Greatness of Yajna" in Gita (III- 9 to 12). Yajna is only in Hinduism. No other religion has it. Yajna is the best of all karmas. We will come to Ayushya Homam at the end. Competition, co-operation and self-dedication are the three ways in which beings make life a fulfilment. The lowest order of creation exists by sheer competition. In this stage, the struggle for existence is an endless warfare. The physically strong and the fittest thrives and prosper, while the weak and the feeble are either left in the background or exterminated. Plants, birds and animals bear testimony to this. This is the physical level. In the life at the mental plane, cruel competition gets minimized. Intelligent co-operation gains ground here. This process is also known as social life. Man is a social being, though corporate life is not his exclusive prerogative. Other beings are also found very well at it. Corporate life is more conducive to growth and progress than the competitive one. Self-dedication is the highest law of life. It prevails at the ethical and spiritual planes. It is given to the enlightened man alone to practise self-dedication. The act of offering the best and the most useful in one for the welfare of the others is self-dedication. Both the giver and the receiver stand to gain through this sacred act. It is like pumping the water from a copious well into a fertile field. This bounteous act goes by the name of 'Yajna', which literally means sacrifice. Meritorious act untainted by selfishness, disinterested service, work of any kind performed for general welfare, adoration of the Almighty, ethical and spiritual endeavours - all these salutary activities are contained in Yajna. Dedicating oneself exclusively to spiritual life amounts to the performance of Yajna. It is the attitude that tranforms the soul-entangling karma into the soul-emancipating Yajna. Divinity reveals itself best where Yajna takes place. Performance of yajna leads man to 'Shreyas'. Has yajna any place in cosmic plan ? The answer comes from the Lord in Shloka-10. "Having created mankind in the beginning together with Yajna, the Prajapati said- by this shall you propagate; this shall be the milch-cow (Kamadhenu) of your desires." Prajapathi (Brahma) created man. For his sake (Food, shelter, education, wealth, health, property, peace, progeny etc. 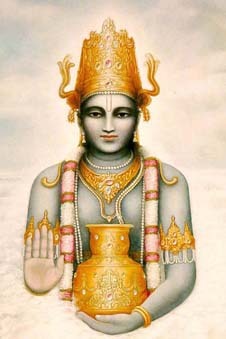 ), Brahma created Yajnas also. It is not creation of one after another. He created man and Yajna together (saha). Infact, Yajna comes first, as mentioned in the Shloka. Life on earth is wrought with misery, however much man may pose to be free from it. Still, there is an unfailing way to convert earthly life into a 'mansion of mirth.' When all activities in life are changed into 'Yajna', the spectacle also undergoes a corresponding change. Man is born to 'give', and not to 'grab'. The grabbing man pays the penalty in the form of misery; the giver reaps the reward in the form of undiluted joy. The means to give somehow increases in the man who has a mind to give. The resources, the bodily effort and the mental disposition - all these becomes multiplied in the man of Yajna. His life flowers in being useful to others and fruits in enlightenment. The doer of Yajna is never in wants; he is always in affluence. Whatever he wants to offer to others comes to him easily. His bounteous mind is the real 'Kamadhenu'. Preyas and Shreyas both do pay homage to him. This is the plan and purpose of the Cosmos. What is the practical shape that can be given to the spirit of Yajna. The answer comes in the Shloka-11. "Cherish the Devas with this (Yajna); and may those Devas cherish you; thus cherishing one another, you shall reap the supreme good." Etymologically the word 'deva' means the one that is shining. In the human frame the senses are called 'devas'. They are shining in their own way and they bring light to the dweller in the body. If food be not supplied to the body, the senses become weak and unable to function. If the senses be abused then also they get worn out. But when they are properly cherished they become useful to bring knowledge and efficiency to man. To the extent man gets enlightened, he looks after the senses with added wisdom and attention. Mutual fostering takes place this way causing good to both. Life becomes enriched thereby. Highly evolved souls are called 'devas', wherever they happen to be. Cosmic forces are also called 'Devas', because of their efficient functioning. The characteristic of the good and the enlightened is that they are always engaged in the welfare of all. It is Yajna to aid them in their noble and auspicious endeavours. The good and the noble in the world spontaneously come forward to serve the doers of good and to promote their noble causes. Those who sacrifice themselves completely to God get their reward accordingly. As the fuel that gives itself away to fire becomes fire in its turn, the devotees who surrender their everything to the Lord, become all Divinity. By sacrificing his all to God, man attains Godhood. This is the supreme good that Yajna brings. In the words of Sri Ramakrishna: "Whatever you offer to the Lord is returned to you, magnified, manifold. Take care, therefore, that you do not offer anything bad to Him". In practice, we offer many items to the Devatas-Rudran, Vishnu, Indra, Varuna, Vayu and so on- through Agni (Fire), chanting specific Mantras, to please the respective Devata. The fire burns these offerings and forward their essence to the particular devata on our behalf. Gods and Devatas are manifestations of Brahman. They depend for their food on the offerings by man in the Yajnas. There is no field and cultivation in the Devaloka. Taittiriya Aranyaka mentions: "Durbhiksham Devalokam." Devatas are more powerful than men. We have to depend on them for rain, sunshine, air etc., which are the basis of our life. Without these elements, we cannot cultivate and produce food-grains. So it is a mutual help. That is why there is the usage of "Parasparam Bhavayantah" in the Shloka-11. If we fail to do yajnas, these Gods and Devatas will have to starve and they will naturally become angry and will create calamities for men. They can make the rain fall only on the oceans instead of on the land area; or they can create floods, earthquakes, cyclones etc. to take revenge on us. Devatas are a very powerful lot. We cannot antagonise them. Chanting of Mantras is equal to writing the address in a letter. It will help the fire god 'Agni' to locate and forward the essence of our offerings in the yajna to the particular Devata. The Devatas also have wishes and wants. If we satisfy their demands, they will become more powerful and happy; and will bestow blessings on us in the form of wealth, rain, food, health etc. If we look after them, they will look after us. We have doing power; they have protecting power. The answer comes in the Shloka-12. "Cherished by Yajnas, the Devas shall bestow on you the enjoyments you desire. A thief verily is he who enjoys what is given by them, without returning them anything." This world abounds in facilities and amenities that have come about as a result of the sacrifices of several people. The new born baby is nursed and brought up. That is "sacrifice" of the parents. The youth receives education. It comes from sacrifice made by the builders of educational institutions. The food that man consumes, the house that he lives in, the clothing that he wears, the means of transport that is available to him - all these are the outcome of sacrificees made by other people. While availing himself of all these advantages, man ought to ask himself as to how his own life is going to be useful to the others. Whatever man does must be more beneficial to others than to himself. His doings become yajna in proportion to their public utility. When a balance is struck between receipts and gifts, a righteous man is he who gives more than he receives. Indebted is that man who appropriates more than he gifts. A thief is he who grabs everything and sacrifices nothing. This seemingly prosperous man ends his career as a non-entity. The enlightened do not place themselves in that pitiable position. Bhuta Yajna - Looking after other domestic animals, birds etc. All the five of them form his 'Nitya-karma' (Obligatory work). Through them the life of man on earth becomes prosperous and auspicious. Shloka-14 again stresses the mutual dependence between man and God. "From food beings become; from rain is food produced; from Yajna rain proceeds; Yajna is born of karma". Work performed with the right frame of mind gets converted into Yajna. It is the thought or the feeling that really constitutes the mental force - Mantra. Homams are Yajnas performed to propitiate a particular 'Devata', expecting some special gifts or blessings from Him. In every Homam we invoke 'Agni', the God of Fire. Man needs the blessings of God for his life, health, education, wealth, profession, fame, power, family life, mental peace and finally a peaceful death. Among these long life is the most important; ie. years to life. All the other factors add life to the years. Whatever it is, nobody is happy to die early. Everyone wants to extend his period of life as much as possible. Sage Bodhayana, in His Bodhayana Sutras, explains about the 'Ayushya Homam'. In the Hindu scriptures we find many incidents - Markandeya, Satyavan, Adi Sankara, Nachiketas and so on - which prove that the destiny of 'Life' at the time of birth can be modified by various actions later on. For this purpose, special Yajna is performed to please the 'Ayur Devata', on the birthday of the person concerned as per his name, nakshatram, rasi and gotram. It is an appeal for sanctioning maximum life-term, so that he can do more good things in life. Yahoo! GeoCities provides all the tools you'll need to create your own personal home page on the web.